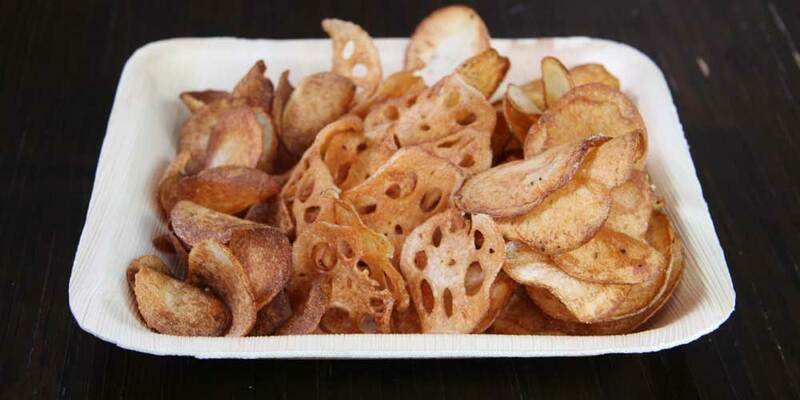 Frying potato chips at home is surprisingly easy, and fresh potato chips are much more delicious than store bought. That said, you don’t have to just fry potatoes. 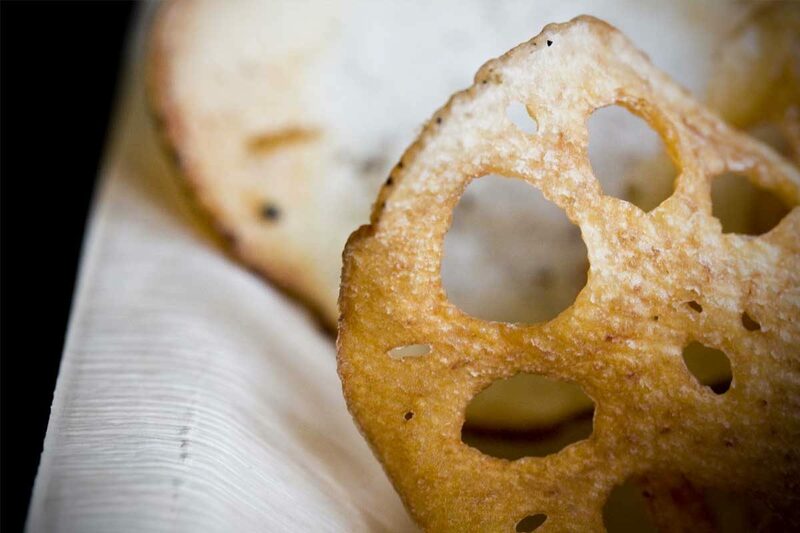 Lotus root chips have a slightly creamy, slightly sweet flavor, look gorgeous, and crisp up even better because of their holes. Taro root also makes great chips, and this same technique can even be used with sunchokes, as in our Perch Fish & Chips Recipe. You can use any of our specialty salts to season your chips, but we’ve suggested a few varieties below that work particularly well. High heat oil (canola, peanut, etc) – amount depends on your pot or fryer. Wash the taro, lotus, and potatoes. Remove skin from the taro, but leave the skin on the lotus root and potatoes. Slice them into 1/16th of an inch thick disks. Though you can use a knife if you have exceptional knife skills and an exceptionally sharp knife, it’ll be easier (and you’ll have much more uniform results) to use a mandoline. Soak the slices separately in bowls of cold water for at least 1 hour (up to 6 hours) to draw out the starch. While the root vegetables are soaking, heat at least an inch of oil in the bottom of your pot (or the amount of oil called for in your fryer’s instructions) to 375 degrees. Remove your chips from the water and dry them off thoroughly sandwiched between two towels (the water running off the taro chips may be slimy to the touch…but don’t worry, that’s normal). Be sure to dry the potato chips, as excess water can cause the oil to sputter. Have a large bowl handy to toss the finished chips with salt and pepper. Add the chips to the fryer one at a time so that they do not stick to each other. Be careful not to overload the fryer or pot, as this can drop the temperature and result in oily chips. If using a pot on the stove, do not put more than a single layer in at a time. Use tongs or a spider to turn the chips in the oil, frying them until golden brown and crispy (taro chips will be darker). Make sure your oil is back up to 375 degrees before adding more chips. Remove the chips from the oil, shaking them gently over the oil to drain. Put them in the large bowl, and top with fresh cracked pepper and the specialty salt of your choice. Toss to coat. Where can I buy Taro root in the Chicagoland area? We can ship taro root to you via FedEx Overnight. Let us know if you have any questions!